It makes sense that the people best suited to bring new supporters into the fold are those who already care about your cause, turn up at your events, and give to your organization. But even we were surprised when we dove into the data and saw just how wide the social reach of an organization’s supporters could be. It’s truly amazing. 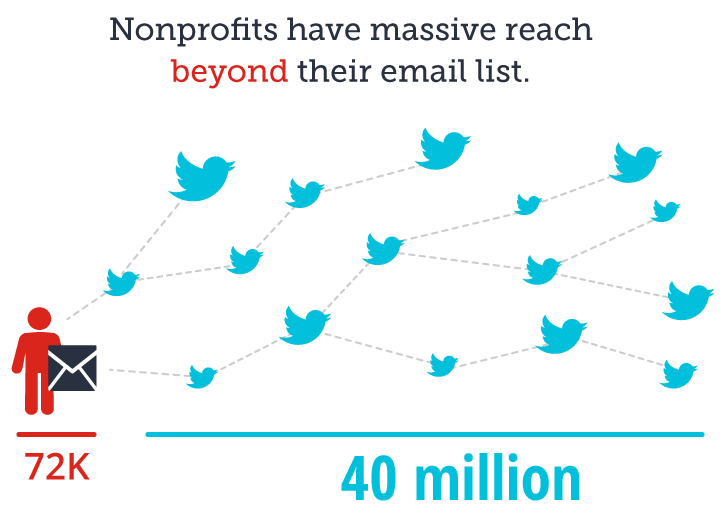 See for yourself with our new infographic – The Amazing Network Reach of Nonprofits. After evaluating 90 of our own nonprofit clients, representing nearly 20 million supporters, we learned a few things that we knew would shake up how people are currently engaging with their existing supporters and email lists. To start, we found that nonprofits can directly reach an average of 40 million people when accounting for the reach their supporters have on social media. This prolific reach is from organizations with an average of 72,000 emails that have publicly available social profiles. Across the board, we find around 50 percent of emails have publicly available profiles. The average email list size for this evaluation was 144K. While every supporter on an organization’s email list has the ability to spread the word, influencers hold the greatest power to share content. Online influencers are game changers because of the extensive reach of their network but also the trust of their audience. These are individuals that have a large Twitter following, lots of Facebook friends, a blog perhaps, and maybe even a great Instagram account. By tapping into the power of an influencer, an organization can reach a wide audience of potential supporters much more effectively. 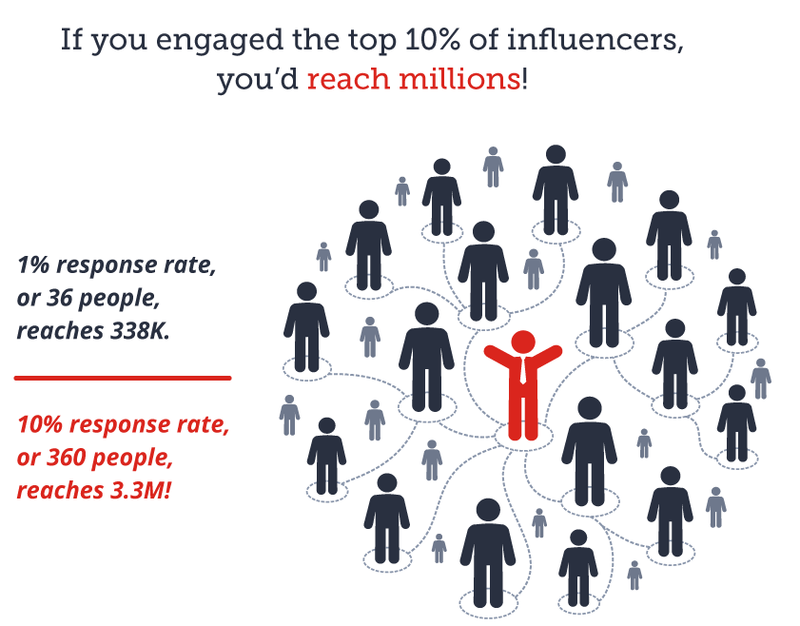 In our recent research, we found that the top five percent of influencers (those with the greatest reach) on an organization’s email list can reach an average of 34 million people, or 85 percent of the network’s total reach. This is 200 times greater than the number of people sitting in the organization’s CRM. 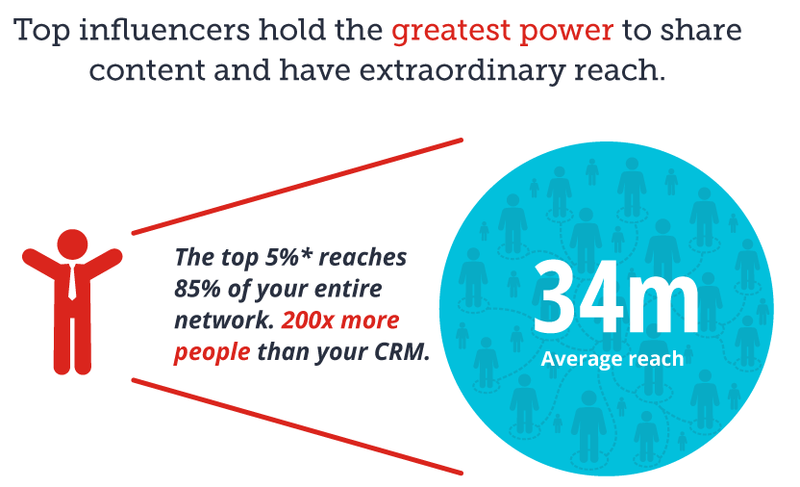 If an organization is able to engage even the top one percent of these influencers (36 people on average), the social network reach could be up to 338,000 people; engaging the top ten percent of these influencers or 360 people on average, could expand an organization’s reach up to 3.3 million people! Influencers work because they are using the most trusted source of marketing – word of mouth. Engaging an influencer with your organization’s best content takes advantage of the most effective type of marketing – word of mouth. A BzzAgent study found that influencers are 70 percent more likely to be seen as a trusted source and are 75 percent more likely to share great experiences about companies online. These influencers also create on average twice as much content as non-influencers, meaning a larger quantity of messages are going to be spread across their networks and the Internet. With the proper relationship, just a few dozen influencers can amplify and endorse your message to people that are actually willing to listen and take action at their request. While the goal is to expand your organization’s network reach through powerful influencers, its important to first understand what makes an influencer worth engaging. Without a clear direction and some ways of measuring their impact, working with influencers won’t add value to your marketing campaigns to their full potential. A good first step is to identify influencers in your organization’s database. 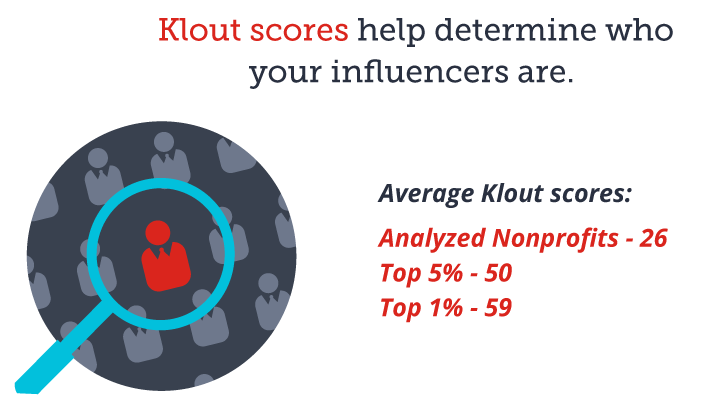 The higher the Klout score, the more likely the person is to both share content and have their followers engage with it – this makes it all the more important to engage with them. This goes for the number of connections as well – people that are well connected often have something important to say, and followers willing to listen. To better understand an influencers relevancy, take some time to listen to what they’re saying online. What topics are most important to them? And more importantly, from a marketing perspective, do these topics intersect with your campaigns? With a social listening tool like Attentive.ly, you can make an informed decision on whether this is the right person to be promoting your campaigns. Though not required, it’s far more likely that influencers will engage with a personalized ask to share if they have already been involved and taken action for your campaigns in the past. When starting up an influencer program, our strategy partner Fission, suggests going after the low-hanging fruit and look for influencers that have already donated, signed a petition, attended an event, or taken other actions on your behalf. While you may be on the lookout for the hottest celebrities on your email list, keep in mind there are many other influencers as well that influence people to change their opinion or behavior as a result of exposure to new information. This includes VIPs (i.e. celebrities), professionals, and citizen influencers. We personally love citizen influencers because they are often overlooked, yet constitute a powerful force as a group. From a marketing perspective, anyone who isn’t a celebrity or professional is a citizen influencer, though with fewer connections. This type of influencer on your email list generally has 500+ social media connections and a Klout score over 40. A great citizen influencer to engage with is a person who often uses their social accounts to spread the word about important actions, and advocates for issues outside of their immediate professions. Often the best way to get a citizen influencer to spread the word about your work is to just ask (and thank)! Once they’ve been identified, the ask for engagement is the most critical piece to get an influencer on board with your campaign. This includes an explanation of why you’re reaching out, recognition of their importance to your campaign, and a simple action ask. For this first action, instead of asking them to buy or donate themselves, start by asking them to promote your brand or organization to their network – given that they are already talking about the issues you are tracking. Their help can then be rewarded with promotion of their work or matching donations for referrals. Don’t be afraid to be creative in your rewards (thanking and reporting on your success is perfectly fine).